D Magazine is doing one of their annual online polls and this one is on the best food in Dallas. Surprisingly, their BBQ category ranges far afield from Big D proper and even goes as far as Casstevens Cash and Carry in Lillian. 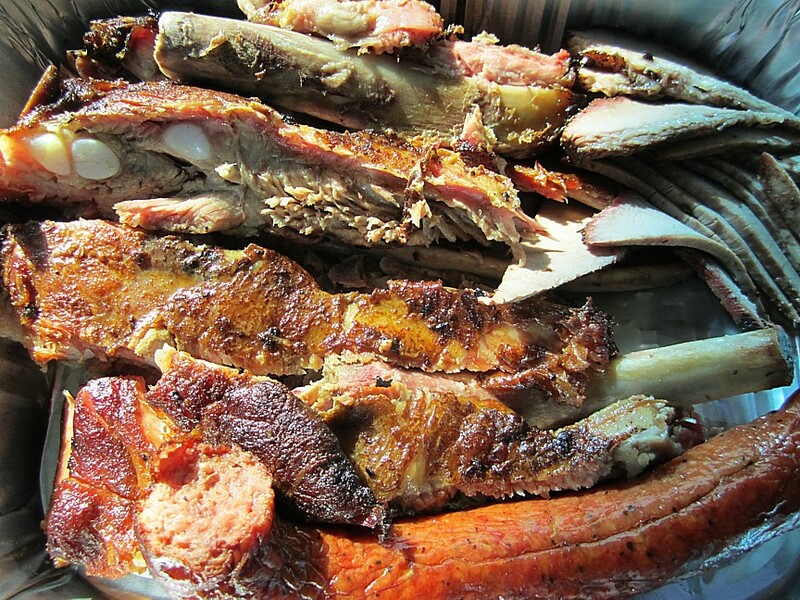 There are many fine (and not so fine) joints on their list, but surprise, North Main BBQ in Euless made the cut this year! You can guess who I am voting for, and you're allowed to vote and re-vote hourly through March 13th. No registration is required. I doubt I will do it hourly, but I bet I do vote more than once! 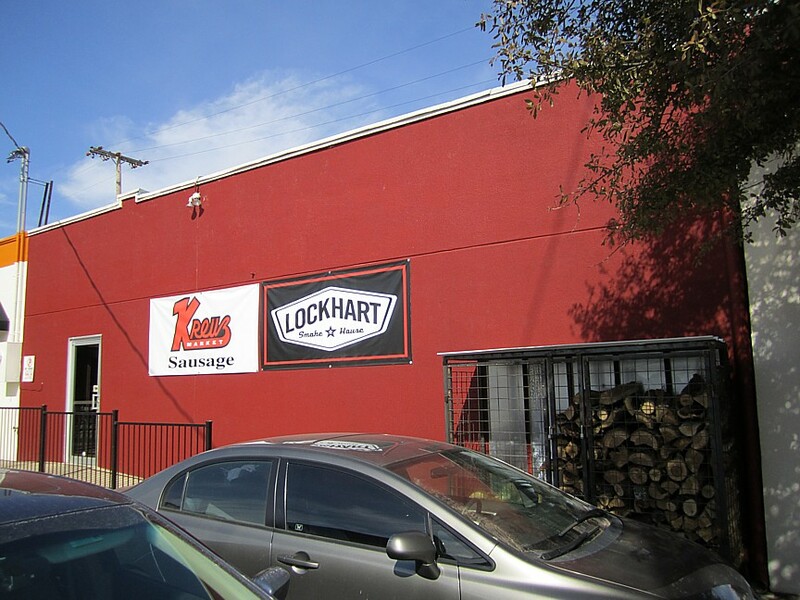 My little brother lives a few blocks from this joint in Oak Cliff and when I told him I was headed to Lockhart Smokehouse today he said he likes this place better. I had to stop and check it out since it is only a few blocks west of the Lockhart location. So happy Valentines day to me, #2! 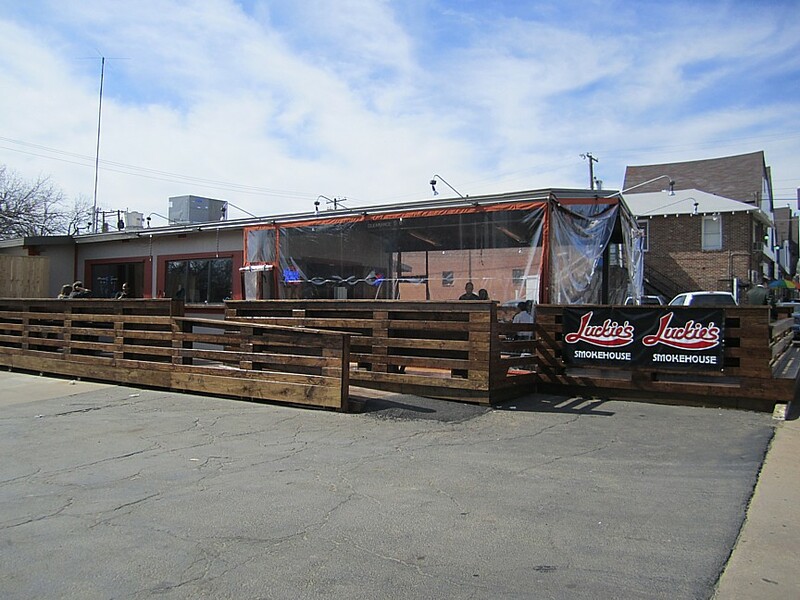 First off this place is not your typical BBQ joint. I wandered around a bit before I found out it is a sit down waitress service restaurant, not your usual BBQ buffet joint. Once you find that out and get a menu, you can order to go from the bar, and that's what I did. When I asked for a 3 meat plate, the bar guy told me you can't order ribs on a 3 meat plate. You either get a rib plate, half rack or full rack if you want ribs. Well I wanted to try the ribs, so I got a half rack and a 2 meat plate! I skipped the sides so he upped my brisket to a full half a pound, which was nice. While I was waiting, I noticed a $2500 painting hanging on the wall for sale. Yup, Oak Cliff is yuppieville and your usual dead animal heads just won't do. When my order arrived in a nice covered aluminum pan the barman took the top off to show me all that food. He asked if I wanted sauce (they have 3 kinds) but after a nibble on the brisket I knew it was not needed. One little bite and I had an explosion of smoke flavor in my mouth. Well alright! As tempted as I was to dive in right there, I figured it would be best to let my previous lunch settle a bit on the 30 minute drive back home. By the time I got there the cab was full of smoked meat smell. Ah, my favorite Valentines day perfume! The meal arrived back home, still nice and hot. A couple of nibbles of brisket confirmed the first bite was no fluke. Super smoke flavor, tender and moist. Probably the best brisket I have had in DFW. My only complaint was that it was trimmed extremely lean, with only the slightest bit of fat. The ribs were a might overcooked, they had mostly separated from the bone, but they were very tender, and very juicy with a nice hint of smoke flavor. I found myself dabbing juice from my chin, just like at North Main! These were nice big spare ribs, even if they were a bit overcooked. The sausage was not your typical central texas ring, more like one twice that size and cut in half. It had the Ekrich look, but was spicier and was more moist with, again, good smoke flavor. It won't rank with Kreuz but it was not bad, either. As much as I have crabbed about Lockhart Smokehouse charging $5.25 for a Kreuz jalapeno cheese ring (which is $1.80 in Lockhart) I have to point out that the sausage link here was $6.49! Yow! 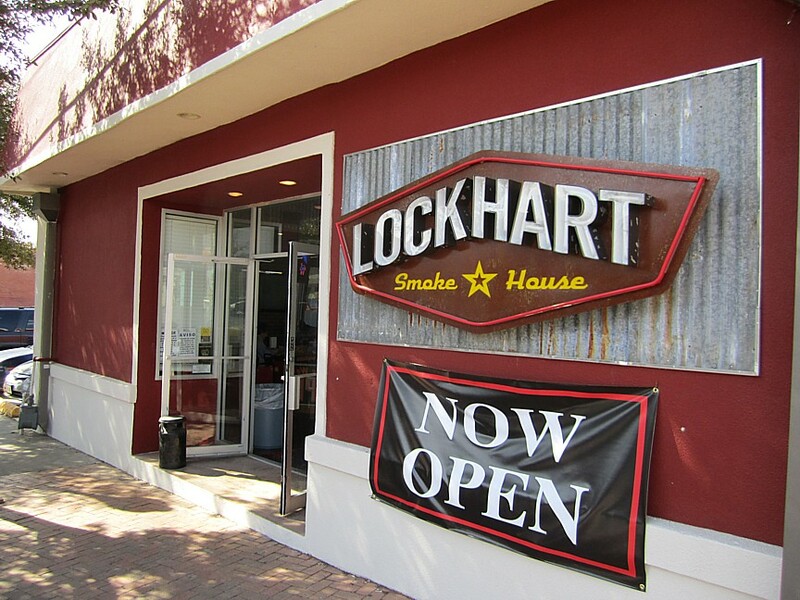 Their brisket is also priced at $7.99 per 1/2 pound vs $7.50 at Lockhart Smokehouse. However they cut you a deal on a full pound at $13.99 where Lockhart charges $15. Still pretty pricey, but it is very good brisket and not a smidgen of fat, if you love it lean. Their pork ribs are $10.99 for a half rack or $17.99 for a full rack. Total for my 2 meat plate with half a rack of ribs was about $24.50. While I paid more here, I also got a lot more meat and it was mostly better than down the street. Now as far as I can find, there is no website for this joint just yet. There is a website for a dead place with the same name that used to be on I-30. Don't be confused by the interwebs. This place also does burgers, salads, etc., but I wouldn't bother with those when the brisket is this good. Lil' bro' done good. Well happy Valentines day to ME! Since it is the day for lovers and mine is out of town, I decided to devote some time to my mistress, BBQ! 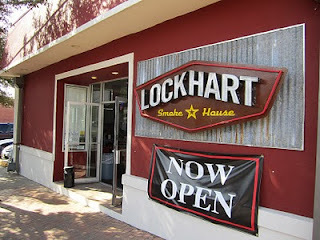 I finally got a chance to make the trek over to Oak Cliff to try the much anticipated Lockhart Smokehouse and got in a bonus run as well. 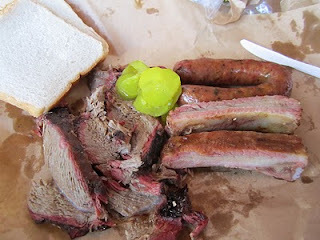 I arrived about 11 am and, after a short wait in line, I moseyed over to my table to enjoy 1/4 lb each of brisket and shoulder clod, a couple of ribs, and a Kreuz jalapeno cheese ring. The shoulder was excellent. Tender, smoky, moist and just firm enough to make a good chew. The brisket was not quite as good. It lacked smoke flavor and the fat was not completely rendered, in fact it was a bit stringy and chewy. The ribs had nice flavor, kind of salty, but were also under done and very chewy. They looked tough when I watched them cut them and that knife did not lie. The jalapeno ring was just as good as in Lockhart. Warmed up perfectly with that great Kreuz flavor intact. You'd never know that sausage came by Fed Ex from over 250 miles away! It's going to be awhile before the locals have this joint figured out. While I was there several asked for sauce and forks. They have a nice new T-shirt with the motto: Wood, Fire, Meat, Beer, but you have to get back in line at the counter to get one. I would think they'd do better selling those at the bar. Though they might not smell as good. Total price for this feast was $17.10 with water to drink and 4 slices of white bread and some pickles in the package. If the ribs and brisket had been better, it would have been worth the price. Considering I can get as good or better (minus the Kreuz link) 2 miles from my house at $12 for all you can eat, it may be awhile before I drag over to Oak Cliff again. At least for this place! North Main BBQ, Euless, Super Bowl eve! After 4 days of ice and snow (I actually had to spend 2 hours Thursday shoveling ice from my driveway) I was in need of some good Q so I decided a trip to my favorite local joint was in order. I figured since the Super Bowl was just 7 miles south, it might be a good idea to miss the lunch and dinner rush so I split the difference and got there about 3 pm. Good plan, but they were still slammed. Doh! The parking lot was jammed but I managed to find, literally, the last spot behind the car wash and against the fence. I noticed with some amusement cars with both Wisconsin and Pennsylvania license plates in the lot. Inside there was a long line, but I managed to get through with a heaping plate of food and find a small table just as the previous occupants were heading out. Most of the other tables were already full. Before I got a chance to dig in I was joined by John and Bonnie from Fon du Lac Wisconsin, who, sure enough, were in town for the big game to cheer on their Packers. I didn't notice it at first, but there were at least 30 or more folks in the place with green Bay or Pittsburgh hats, jerseys, or some other paraphenalia. They told me they had come over from their hotel in Dallas to reconoiter a way to the stadium before the big day. We chatted a bit and I noticed they both had chicken and brisket on their plate, but no ribs. I suggested they might want to try the specialty of the house and later on they did. My meal was a perfect plate (two actually) of happiness. The ribs were tender and juicy as always and I used a bunch of paper towels sopping the trickle of grease on my chin. I stuck with burnt ends only for the brisket and it was awesome as well. A few bits were chewy, but the smoke flavor was deep and lasting. One bit had a beautiful sugar cookie of fat which just melted in my mouth leaving a deep smoke taste. Yum! I had a little sliced chicken breast and it was moist and tender, as it usually is. The potato salad was average, as always, but was a nice compliment to the meat. My new friends from Wisconsin finally got a couple of ribs and after tasting, the first words out of Bonnie's mouth were "Oh my God!" That pretty well sums it up. After that they went back and got more ribs. 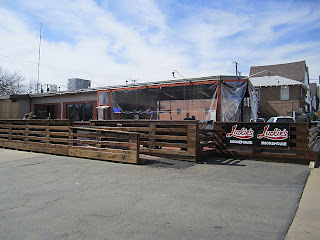 No pictures today, but I was happy to see so many visitors enjoying my favorite local joint. I asked the Packer duo where they had heard of North Main and they said they had just googled around for restaurants near the stadium and liked all the reviews they saw. Hooray for the internet!